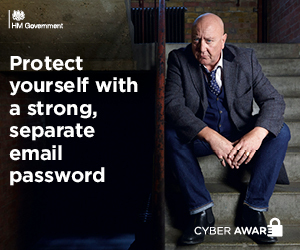 Cyber Aware is an awareness and behaviour change campaign delivered by the Home Office to help individuals and small businesses protect themselves from cyber threats. This supports our commitment to be at the forefront of cyber security to protect our customers and we are proud to be Cyber Aware partners. Cyber Aware’s research has shown that small business owners and third sector organisations tend to think they have nothing of interest to cyber criminals, but the unfortunate reality is that anyone can be a target. Although it’s possible that cyber criminals may attack particular businesses based on their assets or ethos, more often than not the “target” is any business that shows vulnerability. Think of a car thief trying the handles on a row of parked cars. The one car that’s unlocked may not be a Ferrari full of gold bars, but that one unlocked car will be the one that’s stolen. All businesses will at least hold some value to cyber criminals. Although we’re happy to take care of the complicated stuff for you, we like to make sure the businesses we work with are equipped with simple, easy to follow advice that can make a genuine impact on their cyber security, which is why we support Cyber Aware’s initiatives. The #OneReset campaign is all about encouraging us to keep the password for our email account strong and separate. Ensure the password for your email account is strong by using three random words to create a passphrase you can easily visualise and remember. Using letters and symbols will add another layer of strength. So for example, a strong password could be 4FuzzyCowsEat1ng! Can you picture that? Then you should be able to remember it quite easily. When you use the same password for multiple accounts, one breach of data on any website could leave many or all of your accounts vulnerable. It may not be too much of a problem if the password for that one website you used 3 years ago to bulk-buy cat litter is exposed, but what if the password to your email account suddenly became available to someone with malicious intent? There’s more than likely a huge amount of personal and business information ready for the taking there. Information found in a poorly protected email account could be used for extortion, fraud, identity theft or as a way to infiltrate and infect a business and/or its supply chain with malware. We challenge you to make #OneReset to your email password today. While you’re there, if you have the option to set up 2FA on your account, do that too to keep your data extra safe. There are more simple, easy to follow cyber security tips in our Information Security archive. Read our latest cyber security report.